"The Search For Haunchwood House"
What have George Washington, Thomas Jefferson, King Malcolm 1st. of Scotland, Alfred the Great, Henry 1st. Duke of Saxony, Emperor Charlemagne, Hugh Capet, King of France, William the Conqueror, Barons Grey de Ruthyn, Lord Mountbatten, and a Chess Automaton called “the Turk” and Stockingford got in common? – Haunchwood House! Haunchwood House has bugged me for years. 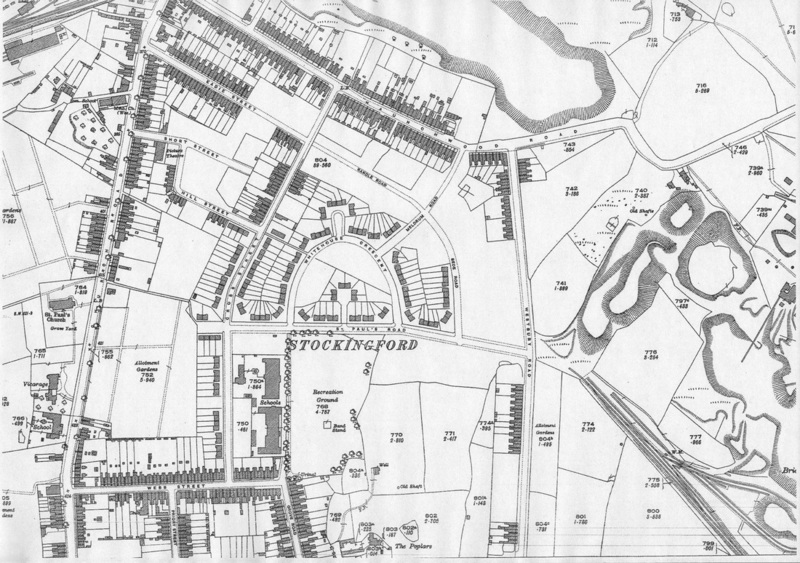 There once stood a substantial mansion in 36 acres of grounds with a small colliery and brickyard as part of the estate on the miry area of Nuneaton we now call Stockingford but was once all open fields known as “The Common”. Haunchwood House was demolished in 1920/21 and there seem to be no surviving photographs of it. Of all Nuneaton’s mansion homes it is the most mysterious. Yet it was documented in the late 18th century, and may have dated back to the beginning of that century. 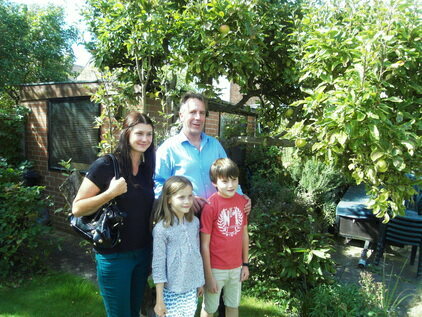 But the most remarkable part about it was the families who lived there. 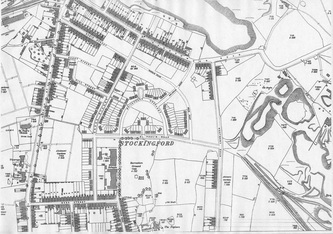 It was occupied by some of the most interesting people who ever lived in Stockingford and they really put this suburb of Nuneaton on the historic map. The first I have discovered, but obviously not the first occupant, was Alexander Donald born 1745 in Cardross in Scotland. His father was a partner in a Scottish shipping company. They plied their trade between the Scottish ports and America. He was orphaned in 1760 and at the tender age of 14 he inherited his father’s immense fortune. He went on to become a great merchant in his own right following his father’s trade between Scotland and America. 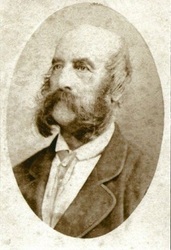 He became a magistrate of the city of Glasgow and later a citizen of Richmond Virginia. During his time in America he became a personal friend of Thomas Jefferson, and was in the circle of George Washington whom he stayed with twice at Mount Vernon. Then, of course, came the American Revolution. In 1786 he became a citizen of Virginia and it is thought that through that singular event, the revolution, he lost a substantial amount of his business, which forced him back to Britain by 1790. On his return his vast fortune dwindled further and after being declared bankrupt lingered for a while in debtor’s prison. A sad situation to someone whose fortune had been lost through circumstances beyond his control. 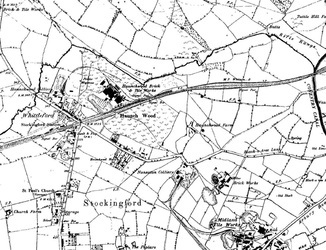 In 1795 he had acquired the lease on Haunchwood House, with its colliery estate at Stockingford, which was subsequently threatened by his financial problems. 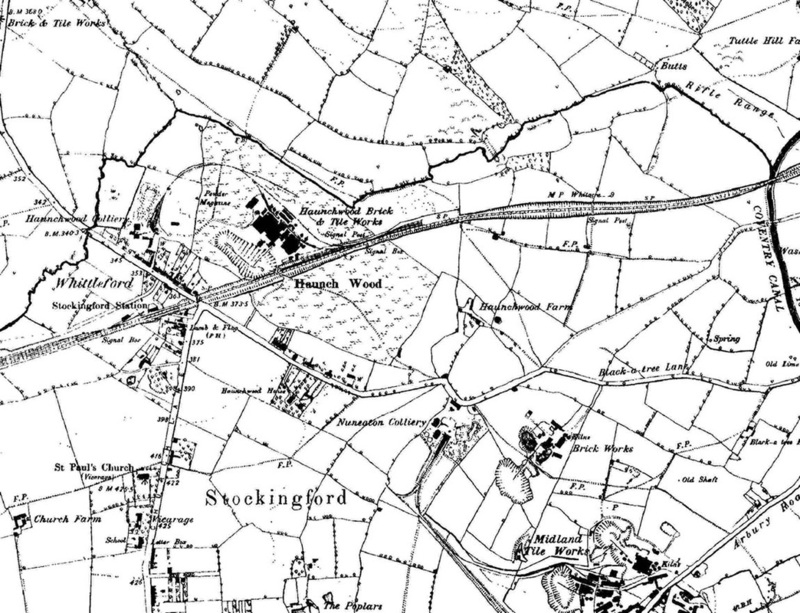 But by a fortunate twist of fate he inherited a sum in 1803 from his uncle, which restored his finances so he died comfortably at Stockingford in 1808 and was buried in Chilvers Coton churchyard. 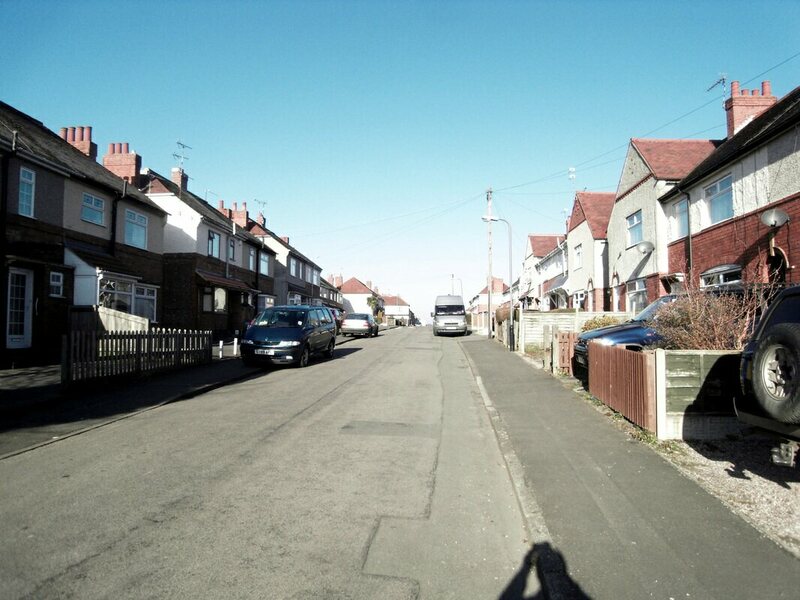 Alexander Donald described his trade in his will as a coal miner, and there is no doubt he took a great deal of interest in the colliery on his estate. Correspondence exists where he discusses the various merits of the steam engines and equipment he purchased for his mine from the famous engineer – James Watt. 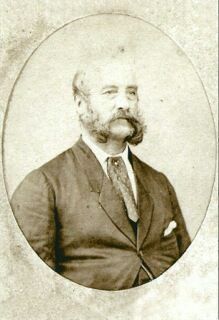 Alexander’s son James Donald lived in Jamaica and he had two daughter’s Sarah and Janet. After Alexander’s death Janet and her husband, another Scotsman – William Dorsey who were married in Nuneaton in 1806, continued to live at Haunchwood House and they had two sons, Alexander James Donald Dorsey (1812- ) who became a Scottish Episcopal Clergyman and an expert in the Portuguese language, and William McTaggart Dorsey (1813-1878) who became a doctor in New Zealand. In Alexander Donald’s will he left money to his friend John McTaggart, a merchant of London. John McTaggart was a wealthy ship owner and merchant who was a partner in the firm of Kymer McTaggart but their story is peripheral to this, although it is intriguing the influence John McTaggart had on the residents of Haunchwood House. Note also the Scottish connections at the time. How strong they are. I find it incongruous that these great people, with their maritime background, not to mention being Scottish found their way to this non-descript outpost of North Warwickshire, as far away from the sea as you can go in any direction. But the story of Haunchwood House takes another strange twist. The Dorsey family move away from Stockingford leaving the estate to be tenanted by another remarkable couple. Peter Unger Williams (1775-1837) and his wife Caroline St. Barbe Williams (1780-1873). Peter was an Exeter born lawyer with offices at Austin Fryers, which is now in the City of London. (This Williams family had been resident in Exeter since the 16th century). As a young man he had become a chess expert and during a later phase of his life (1819-1826) part of which was spent in Stockingford, he had been a partner in the operation of a fantastic chess playing automaton known in Chess circles as “The Turk”. The forerunner, I guess, of what we would now term a computer. This bizarre device would compete with people at chess and inevitably win. Bets were placed by an incredulous opponent who was invariably taken to the cleaners. There was talk at the time of “The Turk” being a fraud. That it might be occupied by a brilliant chess playing midget, but a look inside reveals a mass of cogs and levers which would make spending hours in its fetid confines a great handicap to the cerebral game of chess. How it worked I have no idea, but by 1830 Peter and Caroline Williams were living at Haunchwood House, and Peter was listed as a coal owner, proprietor of Haunchwood Colliery. Now this is the interesting thing. Caroline’s father John St. Barbe was a very respectable ship owner, some of their children were mariners, and some took the middle name Kymer and McTaggart!! It seems very odd that the London people, Williams and his new wife Caroline St. Barbe Brown, with ship owning connections, who obviously moved in lofty circles, should end up at Haunchwood House. The connection has eluded me so far. It was Caroline St. Barbe’s second marriage. Her family are one of the most well connected aristocracies in England being descended from every crowned head in Europe. A list of her lineal ancestors was given at the beginning of this article. The St. Barbe’s have a very long and distinguished lineage. Her father John St. Barbe (1742-1816) was a former commander in the Royal Navy, and an elder brother of the Corporation of Trinity House. A name at Lloyds, whilst his maritime interests included transporting convicts to Australia, slaves from Africa to America the Caribbean sugar and coffee trade and the New Zealand seal fur trade. His daughter, Caroline’s first marriage in London to Edward Brown produced three children but Edward Brown died before 1810, and in that year she married Peter Unger Williams. 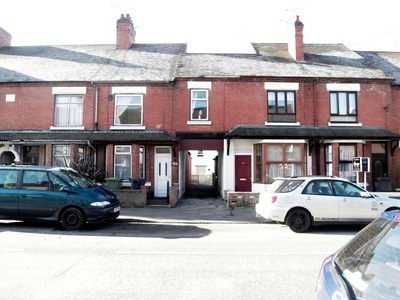 By 1821 they were living in Nuneaton and shortly afterwards moved to Haunchwood House. They also took over the coal mine on the estate and a small brickyard. In 1835 the family leased Charity Colliery in Bedworth. 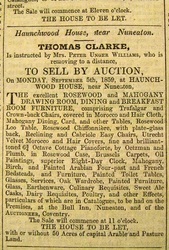 After Peter U. Williams death in a flu epidemic in 1837 Caroline retained the business in her own name but the day-to-day running of the colliery was carried out by her sons John McTaggart Williams (1810-1859) (note that name again – McTaggart), and Charles McTaggart Williams (1819-1858). They had other children Eliza Kymer Williams, and Dorinda St. Barbe Williams christened 1813, Peter Unger Williams (1818-1858), Sarah Moring Williams christened 1821, James Harris Williams (1822-?). 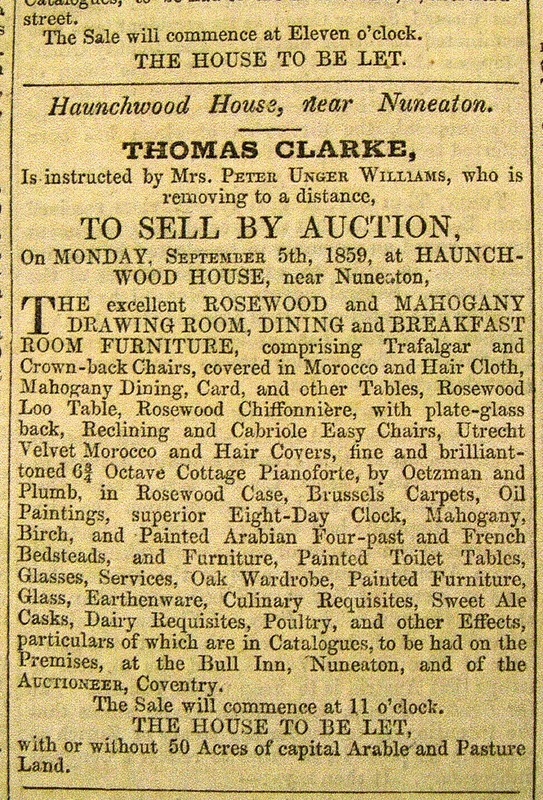 In the 1841 Caroline and the female members of her family were living in Leamington Spa, and John McTaggart Williams was living at Haunchwood House. As we can see from this narrative John McTaggart Williams died in 1859. The house contents were offered for auction that year and Haunchwood House moved to another phase in its history, which I will save for another day. I must thank James Donald for the information on his illustrious ancestor, and the Williams family for their continued interest. If you have any information or pictures of Haunchwood House please contact Peter Lee. 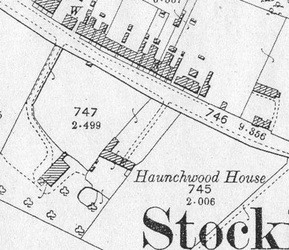 [Haunchwood House on the 1887 OS Map. The main house is to the left and the stable block is to the right. ] 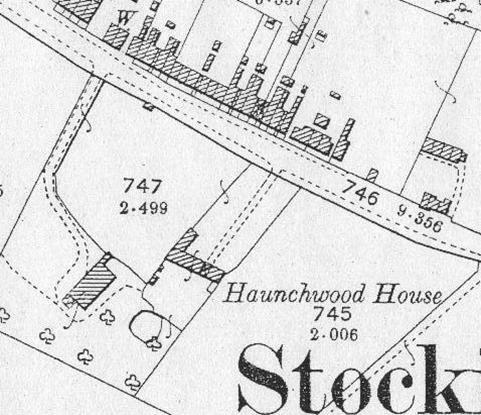 Haunchwood House on the 1887 OS Map. The main house is to the left and the stable block is to the right. The trackway down to the stables from Haunchwood Road still exists in a short section.